The front flaps are in, special weft, anti-scratch PVC weighing 3600 gr/m2, anthracite grey RAL 7016, 3 mm thick, highly resistant to vehicles’ impacts and to tearing. They are reinforced by a 2 layer special weft, tear-resistant fabric suitable to bear torsions and bendings. These flaps are marked with arrows indicating correct positioning of the lorry. Cover is in self-extinguishing PVC, weighing 750 gr/m2 provided with necessary accessories to be fixed to the metal structure. The standards outside dimensions of the dockshelter DSCM-R are 3400 mm x 3400 mm (hxw). This is based on a number of factors such as the most common height of the trucks, platform etc. 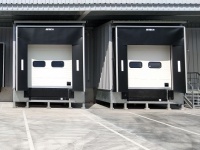 The dockshelter with its standard dimensions is suitable for central docked vehicles, with a width of 2300 to 2500 mm and a height of 3600 to 4000 mm. This standard dockshelter can be used in most cases. The standard dockshelter front projection depth is 600 mm. Based on the standard curtain width, this is the most ideal front projection depth. In some situations a front projection depth of 900mm can be advised.